Announcing a new product is always exciting, but still people may be skeptical and when they read this kind of articles, most of them are looking for a simple answer to the following question: is your product solving my problem? Going directly to the point, if you struggle all the time to find the right documents on Alfresco, you are in the right room. You are in the right room also if you are looking for an optimizable framework, React based, packaged as a full and complete UI, that you can customized, based on your needs, just re-using all components. In a nutshell, Alfred Finder is a web application that allows you to quickly find documents on an Alfresco back-end, preview them and process metadata. The reason why I’m reporting this quote, from one of our customer, is evident: Alfred Finder comes from a clear and common need from our clients to simplify and speed up their life. One of the challenges, in our daily activities, is to take time to step back and think how to automate a specific process, how to find a new and faster way to get things done or simply how to let users spend their time doing the job at hand instead of searching for the needed content. This is why Xenit has been focused, in the last two years, in developing this web framework, to quickly assemble simple business interfaces to your Content Service Platform, with maximum re-use of generic components. 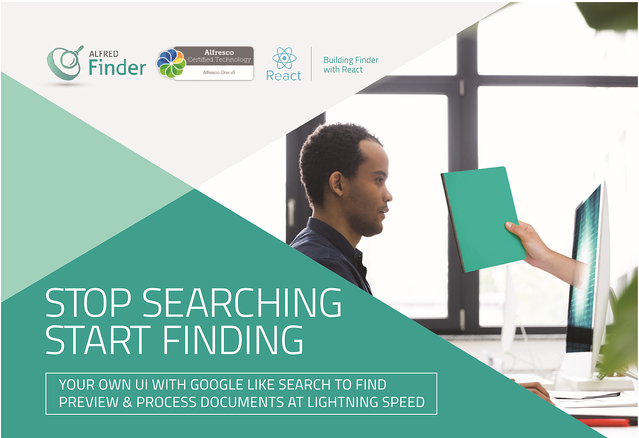 Alfred Finder uses advanced features like customized auto-completion, customized facets, immediate previews, saved searches, previous searches, editable metadata panels and much more. As integrated in Alfresco, you are automatically logged in the Finder application and you won’t be worried about the installation, since there is none required. Alfred Finder is a cross platform, that you can run in a web browser (Chrome, Firefox, Edge, IE11) on all computers. In a series of blog posts, we’ll go deeper into the description of the main functionalities, sharing use cases and opportunities. Today let me show you a general overview on how Alfred Finder looks like. As mentioned, Finder is built on top of React and Redux. The default layout shows you different panels. Together with the search bar, the search results panel represents the results of your searching, meaning the right document, at the right place, at the right moment. The results list is configurable, by choosing the column you would like to be displayed. From this panel, you can also download the document or print it. You can select each component, like metadata and interact with it. Finder, indeed, enables easy edit metadata functionality with the customized panel. You can read or save new comments, see the versions history of the documents, or save a query, to execute it again later on and much more. The design is customizable, by mixing and matching UI capability in a heterogeneous environment, without breaking code or extensive re-testing. In the menu section, you can select your language and more. Alfred Finder chooses the default language of the browser if no language is configured. You can also change the language just the first time you log in, and then the new language is stored in your browser. With his dynamic and complete user experience, fully adaptable, Alfred Finder is the first UI on top of the Alfresco Share Search, with optimized web calls, to ensure you can find and get the information quickly. Finder can be also integrated with 3rd party web application. An use case, from an insurance company, will be shown in the next articles and during our upcoming webinar. Hope you liked the blog article, in the next one, as already mentioned, we will walk through the user-friendly search features. In the mean time you can ask for a and join our webinar, coming up on March 15, 2018.